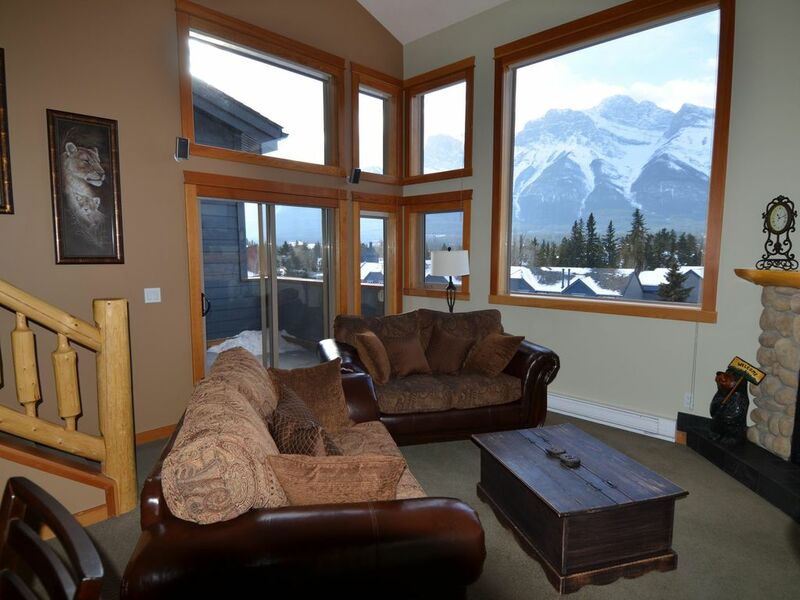 Situated in the Heart of Canmore, Cozy Loft offer you the best views of the Canadian Rockies and all the amenities of a luxury resort. Full kitchen, gas fireplace and BBQ, 2 bedrooms with bathrooms (lower and upper), underground parking tandem stall (2 cars), interior hot tub adjacent to the unit and two exterior ones in the two other buildings of the complex. Close to grocery and liquor stores as well as many restaurants and boutiques located on Main Street. Please note that the minimum rental is for three nights. Born and raised in Montreal, my wife and I moved to Alberta in 1992 since we were both employees of Canadian Pacific Railway. When we first visited Alberta we fell in love with the Rockies and soon we dreamed about having one property in this area. This dream came to reality when we took possession of Cozy Loft in 2003 and to this day we still enjoy going to Canmore and all its associated outdoor activities and of course its proximity to the Banff National Park. Canmore is the only place in Alberta where you can buy property in the Canadian Rockies. Everywhere else are national and provincial parks where owning a property including the land is not possible. Also the Bow Valley where Canmore is situated offers spectacular views of the mountains and is a growing resort town. Finally Canmore is only 1.5 hour from Calgary International Airport by car. Location location location! Proximity to the city centre, food and liquors stores, boutiques, bars and restaurants and 10 minutes away from Banff National Park gate and spectacular view of the Canadian Rockies are the reasons why we selected the Canmore Crossing complex over any other condominium in the Bow Valley area. Complete sets of linen provided. Need complex code to operate except to return to main floor. Indoor adjacent to my unit and also two exterior ones located on top of the two other buildings of the complex. Quick mountain get away from the flat prarise. The Cozy Loft was amazing. Close to all the amenities and the mountain view from every room was amazing. We loved this cozy loft condo in Canmore AB! It’s in a great location with a beautiful view. The unit is very well stocked and equipped. We will definitely be back! Christine, your positive comments are much appreciated. The unit is quite comfortable and has fantastic mountain views. Highly recommended! Mike, your positive comments are greatly appreciated. Oh, it's cozy all right. I wish I could say we loved this place, but we did not. We got a bad tasted in our mouth as soon as we arrived. We were given the wrong code to enter not once, but twice. We were in a strange town as international tourists and no ability to use our cell phones to contact Michel. As we were trying to figure it out, some other guests cornered us in an aggressive and invading manner in the elevator and got a hold of our room code. Lucky for us, that was merely the first of the two wrong codes. This made us question the safety and security of the area from the get-go. Other reviews mentioned how helpful Michel is (directing them towards things to do, etc). Yeah, not so much. I asked for any unique activities he'd suggest in the area and he told me to visit the visitor's center...great...real helpful. We woke up around 7:30 each day, about the time the animals that are living in the ceiling started to make noise. Yes, there is a washer/dryer unit in the building, but it takes 6(!) hours to do a load, so you are better off not planning on having one or running the load overnight. I can't see anyone actually living in the loft. I guess I assumed the bathroom/master bedroom was blocked off somehow from the rest of the condo. No, the bathroom in the loft is open to the entire rest of the condo. So, anyone going to the bathroom up there shares their experience with the rest of the condo. We loved the Mountain views. The kitchen was fully stocked with dishes for whatever you could make. The location of the grocery store was nice as well as the vicinity to down town. Yes, we would go back to Canmore, but we would find alternate accommodations. Julia I am sorry to hear that and I went back to the message that I had sent you prior to your arrival and the right door code was clearly indicated. The reason why i suggest you to visit the tourist center is the are aware of all upcoming activities in Canmore Banff and lake Louise and also possible safety hazards. My photos on the website clearly indicate the the upper bathroom is open. As far as the animal this issue is recent and I advised the condo manager about it. As far as the washer it is also stipulated in my information sheet that this type of washer is for small loads only. Has everything you need and has incredible views. Tomas, your positive comments are greatly appreciated. loved our time in this romantic, well-equipped loft! Michel helped us find the perfect local French bakery for delicious almond croissants. And we enjoyed the rooftop hot tub, looking at the stars and nearby snow-covered peaks in the moonlight. Overall a very pleasant stay! Peter, your positive comments are greatly appreciated. Once payment transfer is made building and unit codes will be sent to renters via email. Also a copy of the house rules and pertinent information on how to get to Canmore and to the complex.